Propability were asked to design, manufacture, deliver and install key themed areas to the store for the festive season. With oodles of experience working at the Disney Flagship Store, Propability were able to enhance the shopping environment and immersive experience specifically for Christmas with themed areas re-creating scenes from the film ‘Frozen’. 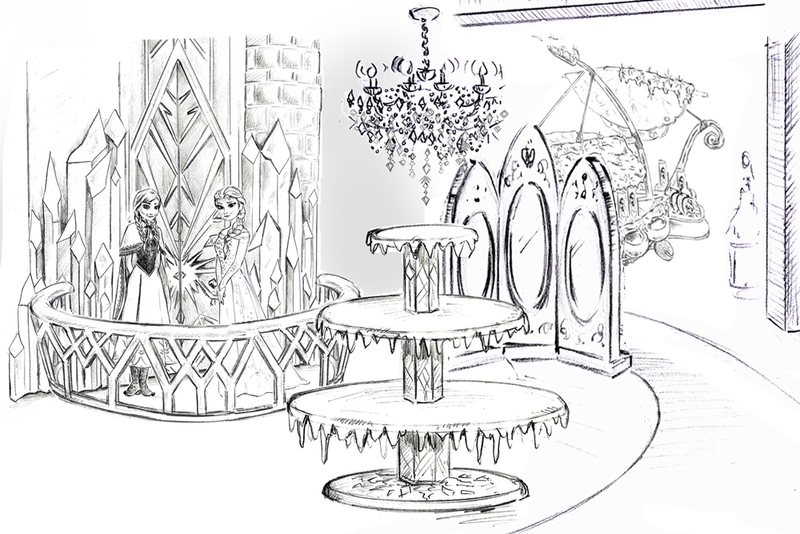 The three key areas that were required included: a Frozen ‘treatment’ to the store’s castle; a Frozen Trading Post structure on the lower ground floor and Elsa’s palace themed areas around the store. All design elements were juxta-positioned throughout the store with quintessential Christmas garlands and trees. Propability were able to take previous experience of building an immersive ‘Frozen’ cave experience and Frozen character sculpts to the project. Enjoying enhancing many of the elements on the sculpts, to produce some of the most beautiful work and detailed costumes and finishing touches to the Frozen portfolio to date. Firstly, the treatment to the store’s original princess castle was carried out to create a ‘freezing’ effect (as if Elsa had cast her spell), fabricated from staggered acrylic shards measuring 2-3 metres each and a total height of 4.5 metres the icicle’s were fixed to two of the towers as well as the front of the castle. The frozen shards were lit by approximately 13,800 lights fitted within the structure to create the full effect together with a revolving sculpt of Olaf the snowman. Furthermore, a fabric banner completed the façade – hung between the castles gold posts featuring the text ‘Welcome to Arendele’. The Trading Post structure and theming on the lower ground floor included fixtures that were hand-made at Propability, as well as a selection of customized off-the-shelf props. A life-size sculpt of the character Sven the reindeer was positioned within his pen environment – appearing as if he was standing in part of the stable. The sculpt was immaculate and took over 90 hours of craftsmanship just to cover with fur! Further Trading Post theming to the cash and wrap area of the store also included a product fixture of Christophe’s sleigh. Finally, Elsa’s balcony area was created, made with MDF flooring and featuring a balustrade that was made of clear acrylic with blue LED lights shining through - to create a magical glow. The door was created with 'live-edge' acrylic to provide a pronounced glowing effect on its cut edges and maximum impactful. Positioned together with more lit acrylic ice shards, a ‘live-edge’ acrylic snowflake chandelier and scenically treated off-the-shelf furniture the area was complete. The all essential sculpts of the key characters from the film brought the scene to life. The full size Elsa and Anna sculpts were spared no attention to detail - each took more than 80 hours to touch-in and paint. Their new dress costumes required over 800 sequins being carefully placed by hand on Elsa’s bodice alone! Installed for the Christmas period, Propability re-vamped the retail location into a bold, vast and impressive showcase of all things bright and twinkly for the Christmas season. The lit-up twinkling Frozen ice environment, the warm and friendly Trading Post setting and the magical glowing and twinkling Elsa’s ice palace environment - all rich with detail and highly immersive features. All areas installed provide Christmas shoppers with ample photo-opportunities, thanks to the entire store being peppered with varied themes - appealing to a large cross-section of visitors.